The perfect packet to teach parallel structure! 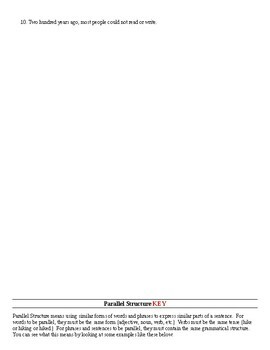 Packet includes explanation of parallel structure, multiple examples, connections to real world examples, and strategies to identify parallel structure. The second portion of the packet includes 3 practice activities. 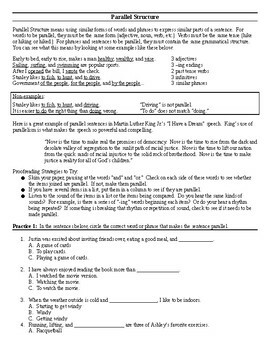 Activity 1 is multiple choice format for students to insert the parallel phrase. Activity 2 asks students to make an incorrect sentence parallel. Activity 3 asks students to identify sentences as correctly parallel or incorrect. This packet is perfect for teaching this difficult concept. Discuss concept in class and practice for homework. You choose!